Teaching assistant: Some college seniors and postgraduate students sometimes assist in teaching college freshmen. The job may also include helping out during exams and grading papers. Talk to a professor to find out if there are openings available. IT technician: The campus office or nearby businesses sometimes need people with technical skills to help in maintaining their computer infrastructure. Keep an eye on the notice board and check the classified ads to see if companies are looking for workers with the kind of skills you have. Production assistant: Many local playhouses or theater companies are always looking for people to help in staging their events. The college’s drama group might have positions available as well. Fast food worker or wait staff: Some college students work part time in the restaurant industry. Those lucky enough to get jobs in high-end restaurants can make a lot of money in tips. Many college students who want to work will have to do a lot of searching before they find a job. Most of them do not need to earn a lot of money. The important thing is that the income helps them to cover additional expenses like rent or food. No matter how small the job is, it will not be easy for any student to do it while giving enough time to their studies. The following tips are helpful in learning to balance both school and work, whether they are working full-time or part-time. Set clear goals: When you have a sense of what you want to achieve this will help to keep you focus. Goals help to motivate you and keep you aware of what needs to be done and when. Do not hesitate to treat yourself as a reward for accomplishing each goal. Develop time management skills: This is important if you expect to do your job and fulfil you school obligations. Create a timetable, and make sure that your job does not clash with your classes. Assign some time for studying for tests and completing assignments. Get enough rest: You will not be able to do well at work or in class if you are not sleeping enough and getting adequate rest. As a working student, you may have to skip some of the partying and other types of entertainment. Ask for advice: Your faculty advisor, professor and even other students can offer a lot of guidance to help you maintain a balance between work and school. Do not hesitate to talk to someone if you are having problems, especially if you cannot meet your deadlines. Talk to your employer: Make sure that your employer knows that you are attending college. Some business owners will do their best to help their workers who are studying by offering employees more flexible working hours. They might even provide time off to study for exams. Join a study group: This is a good way to catch up on those topics you missed because you were late for class or were unable to attend classes. 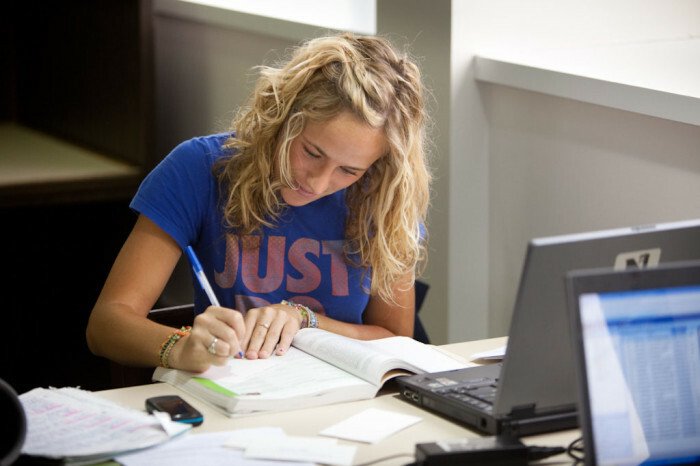 Study groups also help you better understand topics you may have difficulty understanding. College students who exercise are better focused and less stressed, so this is especially important if you are working and studying at the same time. So it is also a good idea to join the gym to help keep you stress level down. As a college student who is working, you will need to learn how to say no to family and friends sometimes. Remember that your goal is to complete your studies successfully. You should not let personal tasks and activities get in the way unless an emergency is involved.